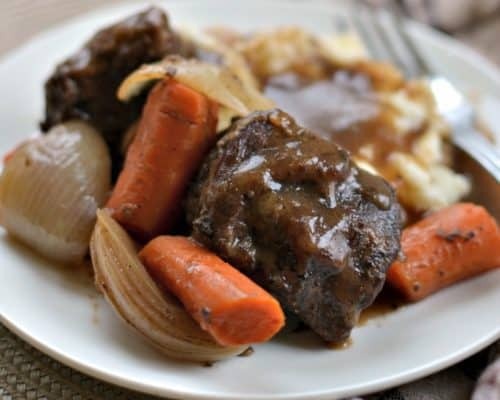 Beef Short Ribs Recipe slow cooks perfectly seasoned beef short ribs, carrots and onions in a broth that turns into an awesome gravy. These fall off the bone Beef Short Ribs Recipe will remind you of those home cooked meals your Grandmother used to make. mmmmmmgood! Are you looking for some great comfort food recipes to get you through the winter months? These cold winter days are perfect for those slow cooking recipes that make your home smell like heaven. You know the home-style kind that your Mom and Grandma used to fix while you were at school. I remember coming home from school to the best smells that good cooking has to offer. I love those kind of meals and now that all the trees are down and the ground is almost a shade of brown those comfort foods are just the perfect pick me up. These fall off the bone Beef Short Ribs are mouthwatering goodness. They slow cook for about two hours. Dutch ovens are perfect because you can do it all in one pan. However if you have an ovenproof skillet that will work as well or you can just use a skillet and a casserole dish. 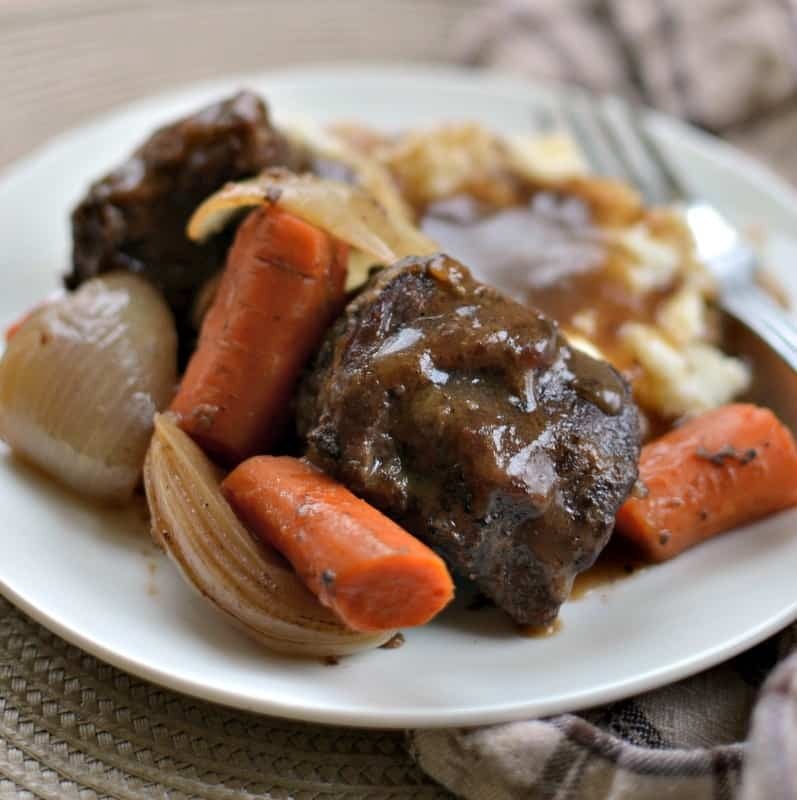 Fall Off The Bone Beef Short Ribs Recipe slow cooks perfectly seasoned beef short ribs, carrots and onions in a broth that turns into an awesome gravy. You can serve with mashed potatoes or egg noodles. Add a nice crusty piece of french bread and you will think that you have won the lottery. How to cook Beef Short Ribs Recipe. First in a large ziploc bag add flour, brown sugar, garlic powder, onion powder, cumin and cayenne. Add the short ribs and shake to coat. Using an ovenproof skillet or dutch oven brown the short ribs in butter over medium heat and remove to plate. Deglaze the pan with a little bit of wine to remove those brown bits. Then add the Worcestershire sauce, beef broth, onions, carrots and browned short ribs. Cover and bake for a couple of hours. Remove the meat and vegetables to a plate. Mix equal parts cold water and cornstarch. Whisk into pan with the juices to create the gravy. Serve the gravy ladled over the meat and veggies. They are a cut of beef taken from the brisket, chuck, or rib. Included are a short portion of the rib bone which is covered by varying thicknesses of beef. They are best slow cooked so the fat that is marbled in them can tenderize the meat. A Dutch Oven is a large heavy pot that works on top of the stove for browning. Then covered and into the oven for slow cooking. It is the perfect braising pan. I love my dutch ovens. I use them for soups and even for deep frying when I don’t want to clean the fryer. Because it is so heavy it helps keep the oil at a more steady temperature. They are so easy to use and clean. Yes folks winter does have its benefits. You might as well take full advantage of the recipes for the season like these lip smacking Beef Short Ribs Recipe because before you know it the season will be over and you will be looking for salads, fruit and grill recipes. Other beef recipes you will love! This post was originally published December 14, 2017 and was republished October 28, 2018 with new content. 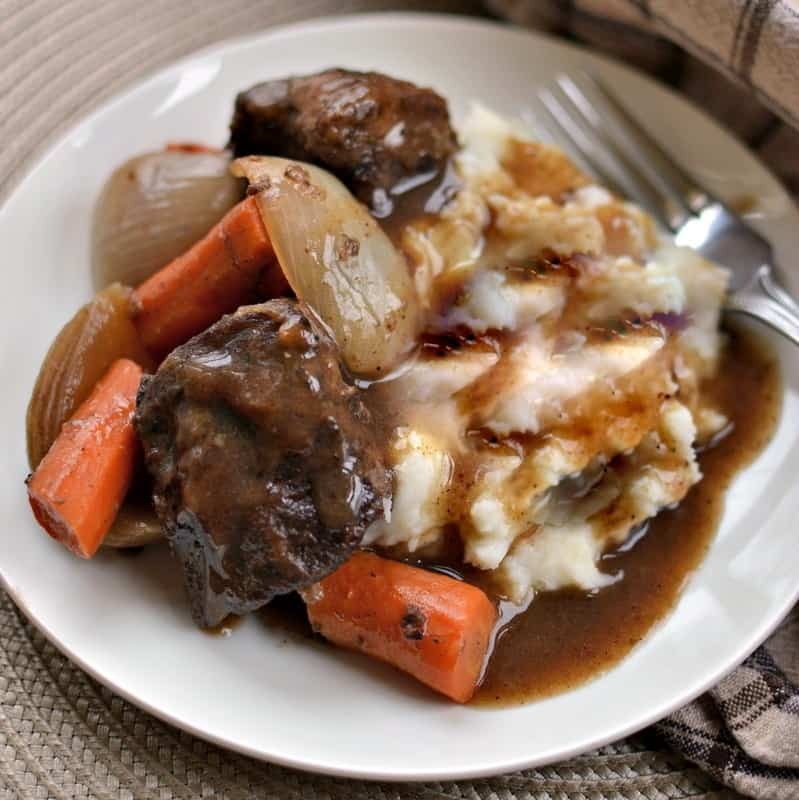 Fall Off The Bone Beef Short Ribs Recipe slow cooks perfectly seasoned beef short ribs, carrots and onions in a broth that turns into an awesome gravy. In large ziploc bag add flour, brown sugar, garlic powder, onion powder, cumin and cayenne. Add short ribs and shake to coat. In dutch oven or large heavy skillet melt 1-2 tablespoons butter over medium heat. Add short ribs and brown on all sides. Do not overcrowd so you may need to work in batches. Add more butter if necessary. Remove browned short ribs to plate. Add wine to deglaze the pan. Stir to remove the brown bits from the pan. Add Worcestershire sauce, beef broth, onions, carrots and browned short ribs. Cover with lid or heavy aluminum foil and place in oven at 325 degrees for 2-2 1/2 hours or until tender. Remove the meat and veggies to a platter. Thoroughly mix 1 1/2 tablespoons cornstarch with 1 1/2 tablespoons cold water, then pour into your sauce. Cook over medium heat for several minutes to thicken. Serve gravy poured over meat and veggies. Thanks so much Susan! I love them too! Thanks for the nice complement. I needed a little pick me up tonight! Sure use vegetable broth or chicken broth. In a quick moment where I don’t want to run to the store I substitute. Maybe I missed it…but what is the servings, 4 – 6? 2-4 There are only about 2 beef short ribs in a lb but you could easily double this recipe. What can I substitute for the wine? With a substitution how much flavor difference will there be? If I use a wine, what dry wine would you recommend? I know nothing about wine. Thank you! You can sub more beef broth for the wine. There will be a little flavor difference. I would use a Merlot or a Cabernet Sauvignon. However if you do not have anyone to drink the rest of the bottle I am not sure it is worth the expense. Use Vermouth instead of cooking wine! Vermouth will last longer much than wine in your fridge – up to 3 months! Wine doesn’t last more than a couple days even with a vacuum stopper. I rarely drink more than half a glass of wine and my husband doesn’t drink wine at all, so I rarely buy it- definitely not for cooking. Thanks for the heads up Mary. Thanks Randy! Such a sweet comment. I sure hope you like your short ribs and look forward to hearing from you! Happy cooking!! Thanks so much! The cumin and cayenne in here are very mild and do not make it taste Mexican. Do you like cumin? It is very mild and somewhat sweet. A couple of suggestion you can skip those spices altogether, you can could skip them and add a little dried basil and a little parsley or you could just skip the cayenne and go with the cumin. Lots of things to play with here….you could also increase the garlic and onion powder a tad. If I double this recipe, how long am I cooking them for ?Also,if I do them it he crockpot, would 8 hours be good on high ? If doubling the recipe and cooking in a dutch oven the time would be about the same. LOW HEAT in the crock pot for about 7-8 hours. Fall off the bone and flavorful for the win! Delicious! Thanks so much Gina! Glad that you enjoyed them!! Such a rich comforting dish. the family loves it. Thanks Robin! I am glad that you enjoyed it! I can’t wait to make this. Beef and veggies like this is the best combo on a cold, winter day. They’re my go-to. Thanks Stacie! They are my go to as well! Winter has some great recipes and this one is no exception! 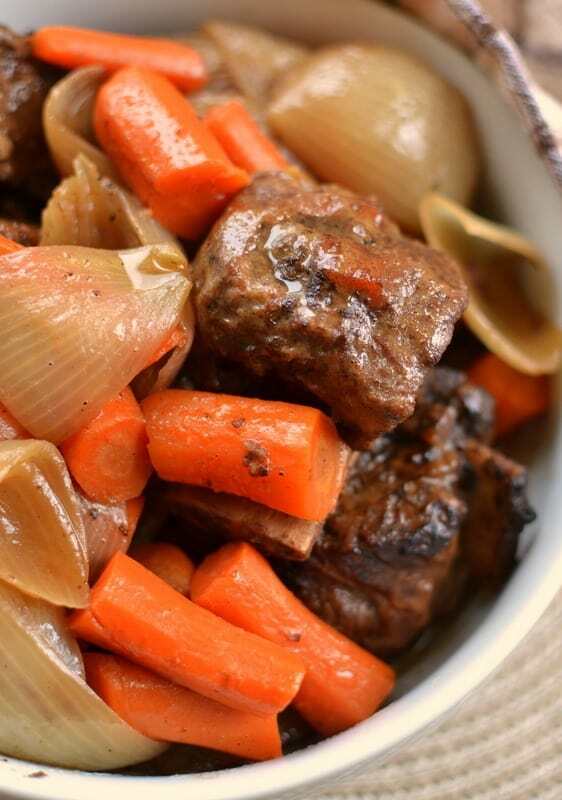 The meat looks so tender and is paired perfectly with those carrots and onions! Yum! Thanks so much Sara! I really hope that you enjoy it as much as we do! I love my Dutch oven! This recipe is great in a dutch oven! I had to print this one out. 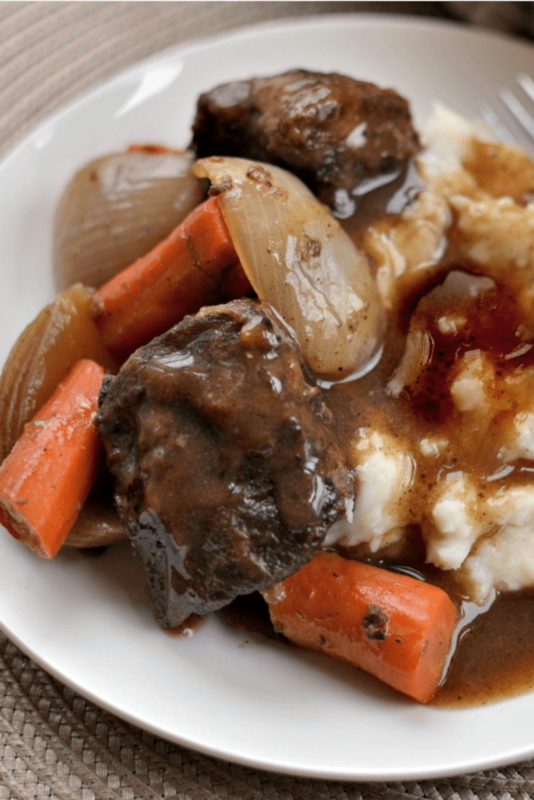 My husband is a huge short ribs fan but I never knew how to make them! Thanks Heather! I am sure hubby will love them! They are so delicious!! This recipe looks so amazing and the way your cooking instructions are outlined, I can tell this dish will be super tender and full of flavor. Saving this pin for dinner this week! Thanks so much! It is a fabulous dish. I hope you and yours enjoy it! I tried this yesterday and with a little dash of tabasco it made alot of difference to the dish. Thanks for sharing. Tabasco makes everything better!! I will have to give that a try!! I’m always looking for new recipes. This looks delicious and I can’t wait to give it a try. I haven’t had a beef dish in awhile..i’ve been stuck on chicken. Thanks Mary! I get stuck on chicken sometimes too! I hope you enjoy it! Beef Short Ribs Recipe is so interesting to prepare. I would like to serve it to my family and friends. That sounds like a great plan Emmanuel! Thanks for stopping by! It looks like an inviting dish. Would love to try it out with mutton instead. I haven’t eaten beef short ribs in quite a long time! Your recipe looks so good, I may just have to add it to my dinner list! Thanks Tiffany! I think you will enjoy them! We love beef short ribs in our family! This looks like a delicious recipe! Awesome! You should try it! It is so delicious! Yes indeed it really does! You should fix it this weekend. This looks so darn good! It’s been a while since I have made beef short ribs for my family. I’ll give your recipe a try! Thank you. My pleasure Autumn! I hope you and your family enjoy it!! My stomach just growled looking at your photos! I know this will be a hit in our home. This will make a perfect dinner after we wrap up sports this evening! The sun finally came out, but it is still chilly! This will surely warm us all up; looks delicious! The perfect meal for these chilly days. Hearty, comforting and delicious! This looks like my next dinner!! Mouth watering!! Thanks so much Jade! I hope you enjoy it! Ultimate comfort food! This looks amazing! Thanks so much Erin! I am sure that your family will love them!! I never review recipes but I felt the urge since this one turned out incredibly! Restaurant quality for sure. My husband and I both adored it. Thanks!! I am drooling over these ribs. I need to make them immediately! My husband couldn’t stop raving about how much he loved this! Definitely going into our regualar rotation, thanks! I could eat this all day long! Love some good comfort food!